It was lost, really. Out there in the big infinite universe, sailing the unknown. And I had no idea where it was. Missing in Action. Hidden from sight. Unaccounted for. The Voyage Beyond simply disappeared one day, when we were moving things around. And then, months later, someone moved a box, and another box, and pushed aside some sheer curtains we use to keep the sun away on hot afternoons, and at the bottom of this assortment of odds and ends was a box with a globe inside. The Voyage Beyond had returned. No one should sail alone. This airship will be making the next trip WITH us, on the way to the Seattle area mid-June for the Edmonds Art Festival. Feel free to stop by and shake the airship into the shimmering clouds of mystic fog. Well, IF we can find it. You never know. One of a kind custom snow globe with zeppelin airship and suspended sailing ship below. Custom wood base with rivets and faux metallic paint finish. All designs and images are copyright (c) 2018 Camryn Forrest Designs, Denver, Colorado USA. Think about it, if we could understand time, we’d understand most of the mysteries of the universe. It’s about time. It’s ALWAYS about time. I often say, it’s a good thing there are deadlines, because without the last minute, nothing would get done around here. But we never know if we have years left, or minutes, or merely seconds. We tell ourselves that time is precious, one shouldn’t waste time, that there is no time like the present. Because, just like shaking a snow globe and watching the shiny numbers flitter, dance and sink again, time is fleeting. We have to make the most of what time we have; we have to dream, we have to be kind, we have to remember to laugh. 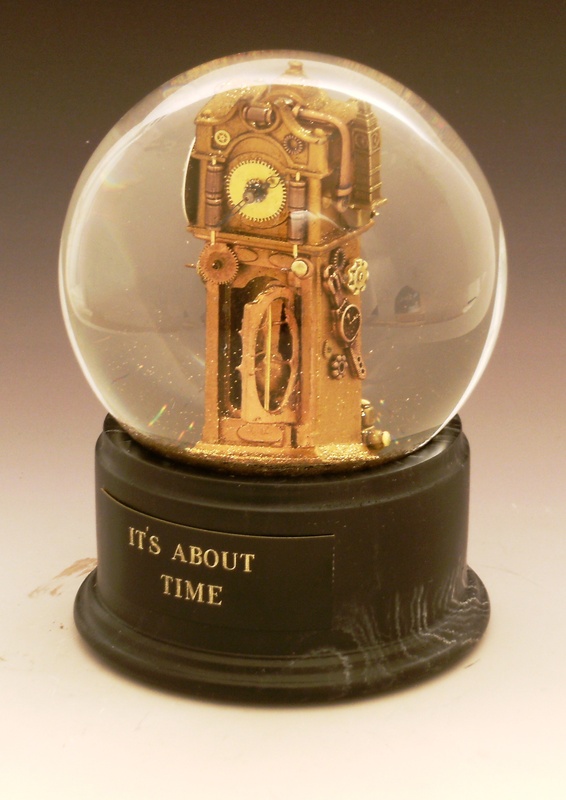 A four-sided grandfather clock, with time-related embellishments and detail, inside a snow globe. When shaken, the liquid-filled globe dances with gold glitter and silver numerals, representing the minutes and hours of time. One of a kind snow globe (snowstorm, waterglobe). All designs and images copyright (c) 2014 Camryn Forrest Designs, Denver, Colorado USA. We are bound to the earth by gravity, by necessity, by our history as humans. So far, somewhere between 500 and 600 individual people from nearly 40 countries have escaped the earth for a small period of time. Spaceships to the stars. Shuttles and space stations, visits to the moon. But the rest of us are earthbound. We are bound to the earth and the earth is bound to us. We are held to the earth, and yet we hold the earth’s future in our hands. Earthbound, one of a kind custom liquid-filled snow globe. Sculpted clay hands, vintage metal toy globe, painted wooden pyramid base with interlocked chain in three gauges. All images and designs copyright (c) 2014 Camryn Forrest Designs, Denver, Colorado USA. What’s that fancy word that means giving human qualities to animals? And while we named him “Identity Crisis,” something about this prairie dog said “I know who I am, and who I want to be;” he’s not just another rodent poseur. One of a kind water globe (snow globe) with tiny embellished prairie dog under a four-inch glass globe. When shaken, the mythical creature is bathed in a sparkling shower of gold microdust. Wooden base is finished with a faux metallic paint, suggesting the patina of age and weathered metal. All images copyright (c) 2014 Camryn Forrest Designs, Denver, Colorado.